In Fall 2018, the Eaton Collection will open its 200 Years of Frankenstein exhibit, which will showcase Mary Shelley’s original work, and also trace its legacy as other voices reimagined the story through new technologies and media forms. 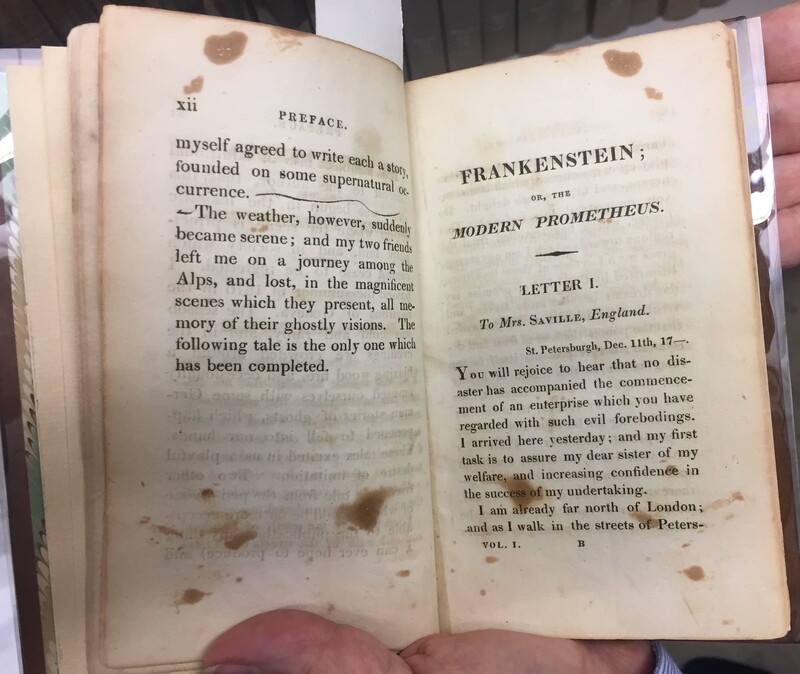 The exhibit will contain rare copies of both the first edition 1818 Frankenstein in three volumes, and the third edition, which Mary Shelley substantially revised and re-released in 1831. Our particular copies are especially interesting, as unique identifiers like Australian watermarks and nineteenth-century shorthand notes tell the tale not only of the story’s history, but of the journey of physical objects that have been read by many eyes and held by many hands, as the books have crossed continents and spanned centuries. This entry was posted in General, Intro and tagged post_by_mb on February 21, 2017 by Jacqueline Jacobson. This blog is a year-and-a-half-long celebration of the 200th anniversary of Mary Shelley’s Frankenstein, originally published in 1818. Shelley’s novel is not only a foundational work of science fiction literature, but also an important cultural touchstone for many genres, including Romanticism, Gothic, horror, and more. As one of the world’s richest and deepest collections of science fiction, fantasy, horror, utopian literature and related genres, the Eaton Collection is a perfect home and context for such a complex and influential novel. Like its famous monster, Frankenstein is a book written in many forms, containing many parts, and combining many seemingly disparate elements – and in the end it tells one unforgettable story. The book has never been out of print since it was published, and has spawned innumerable other creative works and interpretations, including films and television shows, comics and graphic novels, two and three dimensional art, internet memes, and popular slang. 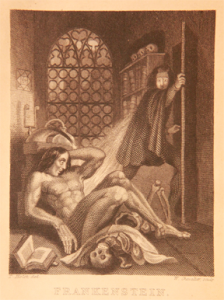 This entry was posted in General, Intro and tagged 1818, 200 years of frankenstein, books, frankenstein, libraries, literature, mary shelley, nineteenth century, post_by_mb, special collections on February 18, 2017 by Jacqueline Jacobson. Welcome to the FrankenBlog. In 1816 Mary Shelley began writing Frankenstein, and in 1818 it was first published. This blog will commemorate some of the key dates in the writing of the work, talk about events to commemorate it, link to interesting Frankenstein bicentennial websites, and post Frankenstein images from the Eaton Collection of Science Fiction and Fantasy. All of this will build to our 2018 exhibit on 200 Years of Frankenstein! This entry was posted in General, Intro and tagged 1818, 200 years of frankenstein, books, frankenstein, libraries, literature, mary shelley, nineteenth century, special collections on February 14, 2017 by Miranda Butler.